I teach a classroom full of eighth graders who have a lot of aha moments while they’re studying Big History, in large part because BHP provides activities that get the kids excited about complex topics. My students have found Unit 3: Stars & Elements to be one of the most difficult units for them to work through, especially when we delve into chemical elements. There is a lot of information for students to sort through and learn before the unit makes sense to them. Even though the unit is challenging, the kids manage to have fun, particularly when we get to the Superhero Element activity in Lesson 3.1. In this, their favorite activity, students are asked to choose an element from the periodic table. They research their element, design a superhero that represents the element, and create a tagline that embodies some of its characteristics. They also create an origin story for their superhero and are encouraged to include either a sidekick or an archenemy based on their element’s chemical properties. This requires them to think through whether their superhero element would want to combine violently or peacefully with another. There are two big aha moments that occur during the Superhero Element activity. The first occurs as students talk to each other about their elements and learn that their respective superheroes might be best friends…or mortal enemies. 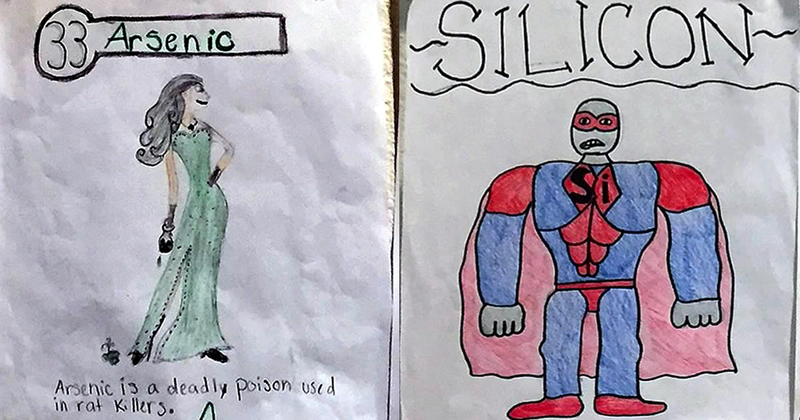 As they talk about their research and make connections between their elements, students can see clearly why their superheroes would (or wouldn’t) get along. In case you’re wondering: Silver and sulfur? Best friends. Chlorine and hydrogen? Mortal enemies. Students experience their second aha moment when we place all of the element superheroes on the wall, in the arrangement of the actual periodic table. Kids then see a visual representation of the periodic table in a way that makes sense to them. They start understanding why the periodic table is organized the way it is. I think this activity is a must-do. If you’re on the fence about including it in your Unit 3 lesson plans, I encourage you to go for it. You won’t regret it. About the author: Jami McLing has been teaching history at her middle school in Idaho Falls, Idaho, for 10 years. This is her fourth year teaching BHP. She teaches the year-long BHP course to eighth graders in two 50-minute classes per day.